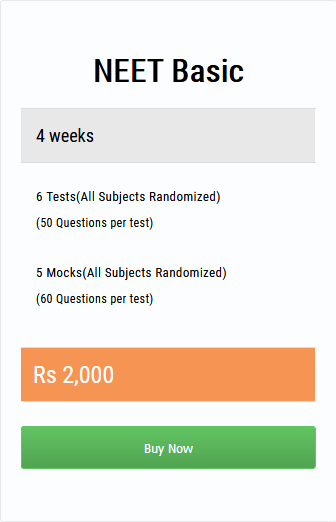 On studying the pattern of NEETPG Exams , The questions are asked on different aspects. The difficulty level varies among questions. Others of moderate difficulty and some intentionally placed to make a real difference. A little percentage of students get those very difficult questions right. Bottom line is that a candidate should not get simple questions wrong. Luck might play a role but very few candidates are lucky enough to have so much luck that luck can get them through. Relying on mere luck would be a folly. A detailed and in depth study would make a difference for NEETPG but for DM and MCh specialities , students don’t have time on their study and most super speciality aspirants complain of lack of proper time for study. However to overcome those difficulties, we at Med exams have provided a very basic module of study. We could see that super speciality candidates get basic subjects wrong. I mean Anatomy and Physiology based Questions for Mch and DM exams wrong. So in the end easy questions turn out to be difficult. What is recommended is to have a basic concept of subjects? Otherwise preparation tends to be difficult. In which of the following tissues is glucose transport into cells enhanced by insulin?